Pierce beef steak with fork several times on both sides. In shallow glass or plastic dish or heavy-duty plastic food-storage bag, mix remaining ingredients. Add beef; turn to coat. Cover dish or seal bag and refrigerate 2 to 3 hours, turning beef occasionally. Heat closed medium-size contact grill for 5 to 10 minutes. Remove beef from marinade; discard marinade. Place beef on grill. Close grill. Grill beef 8 to 10 minutes for medium doneness. To serve, cut beef across grain into 1/2-inch slices. 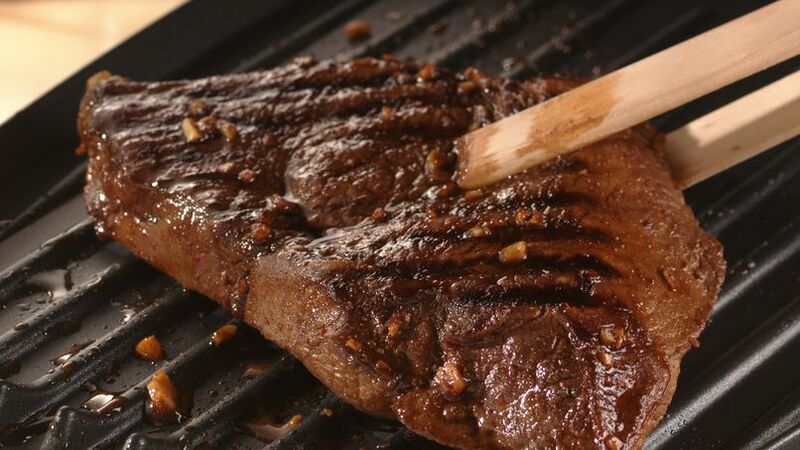 Shave a few minutes of prep time off this Texan-inspired sirloin by using chopped garlic. Look for it in jars near the produce section of your supermarket. Bring the fabulous flavors of Mexico to your dinner table with this grilled beef dish.